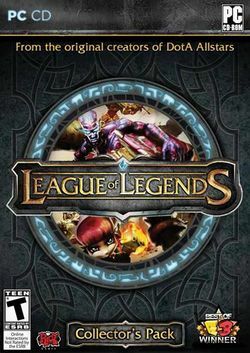 League of Legends (often abbreviated as LoL, and sometimes as LofL) is an action RTS game developed and published by Riot Games for Windows, inspired by the Defense of the Ancients (DotA) map for Warcraft III: The Frozen Throne. It was first announced on October 7, 2008, and released on October 27, 2009. The game was in a closed beta from April 10, 2009, to October 22, 2009. It then transitioned to open beta until release. Players are formed into two teams (either 5v5 or 3v3) and do battle on various Fields of Justice. The classic and most played map of League of Legends is the 5v5 field Summoner's Rift. Before starting battle, players are placed in champ select where they form their team composition of champions that fulfill different rolls (Support, Jungler, etc.). As of October 2013, there are 116 released champions. Each team starts at opposing sides of a map in an area called the "fountain", near a large, round structure, called a "Nexus". A match is won when either the opposing team's Nexus is destroyed or if other team surrenders. To destroy a Nexus, each team must battle through a series of towers called "Turrets". Turrets are placed along paths that lead to each team's base (commonly referred to as a "Lane"). A player's Champion starts at level 1 at the beginning of the match and can obtain the maximum of level 18. For every level a Champion earns, he or she receives a point to level up one of four different abilities their Champion possesses, but a player must achieve level 6 to place a point in their "Ultimate" ability (hotkeyed to "R"). As each player fights in their lanes, they gain levels from killing opposing player Champions and "Minions" (small NPCs that constantly spawn and attack the other team) which give their champion experience. Usually there are wide areas between the lanes of a map. These areas are commonly known as the "Jungle." Here a player can find small camps of neutral monsters. By defeating them a player gains gold and experience and some grant buffs upon death. Throughout the game a player is constantly receiving gold at a set rate. By completing objectives and killing enemy Champions and minions also rewards players with gold, which can used to purchase items, which improve their Champion's stats or help in other ways in their hard fought battle to become victorious. This page was last edited on 16 August 2016, at 16:58. This page has been accessed 11,732 times.